things take much time and energy.I've just been putting on some small additions to my houses in Bol[illegible], and I found that that took much longer than I dreamed it would.That primitive place is dependent for its supplies upon a stage over the grade from San Rafael and a gasoline schooner running to San Francisco and having for Captain a young man of most amiable nature but afflicted with the manana [diacritic] habit. Hence no end of trials to everyone who tries to do anythingin that small remote village. 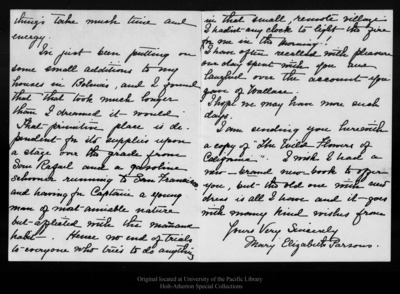 I had'nt any clock to light the fire for me in the morning!I have often recalled with pleasure our day spent with you and laughed over the account you gave of Wallace.I hope we may have more such days.I am sending you herewith a copy of "The Wild Flowers of California". I wish I had a new - brand new - book to offer you, but the old one with new dress is all I have and it goes with many kind wishes fromYours Very SincerelyMary Elizabeth Parsons. American Academy of Arts and Letters. Please contact this institution directly to obtain copies of the images or permission to publish or use them beyond educational purposes.